1st Place: Weeks before this event, Ken Tucker (right) called to confirm he and partner Charlie Terry could participate in this event. During the brief conversation, there was enthusiasm in his voice he could not hide, and now I know why. Their limit was not complete until noon and that limit came by dragging Gary Yamamoto double tail hula grubs between 22-25 feet deep. Color did not seem to matter as they caught fish with both green pumpkin and watermelon color schemes. “We simply fished in areas that hold bigger fish and dragged them slowly to the boat,” revealed Tucker. Their patience paid them $756. Tucker’s enthusiasm a few weeks ago now makes complete sense. 2nd Place: Ken Plencner and Neil Vanderbeizen landed their second, second place finish of the season, but the two could not be with more contrasting styles. At Lake James, the team targeted bedding smallmouth in shallow water, but this time targeted both largemouth and smallmouth between 20-30 feet of water to catch a 15.29 pound limit. with Roboworms. All of their baits were dark watermelon colors. Also like the winners, they had to exhibit exceptional patience. “We only caught 8 keepers all day and just a couple of shorts,” revealed Plencner. Their patience paid off in spades towards the end, “We caught 7 keepers all from one area and the bite shut down. We needed a big fish,” recalled Plencner. “So at 1:30 we tried a different area. 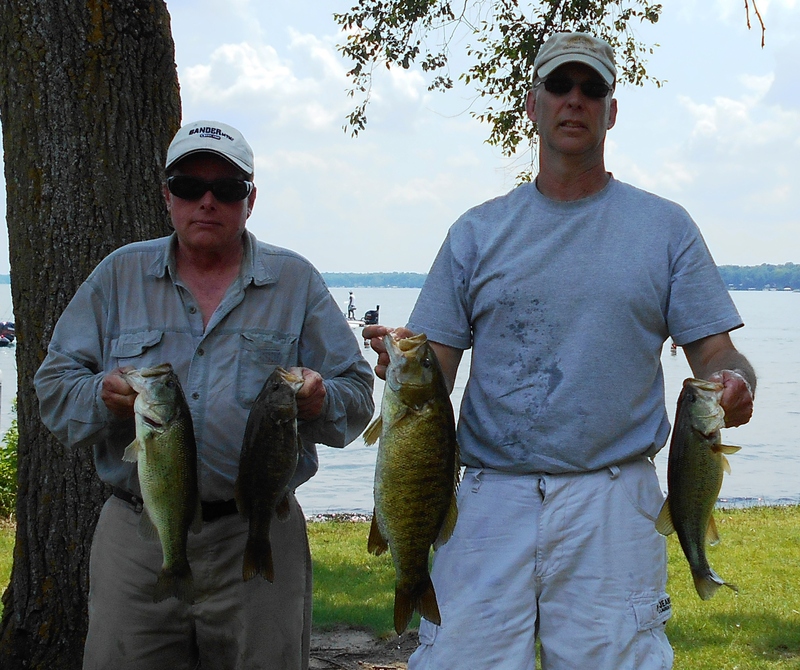 Here we caught our biggest fish.” That big fish, a 4.31 pound smallmouth, ended up being the Money Mouth Baits Big Bass. 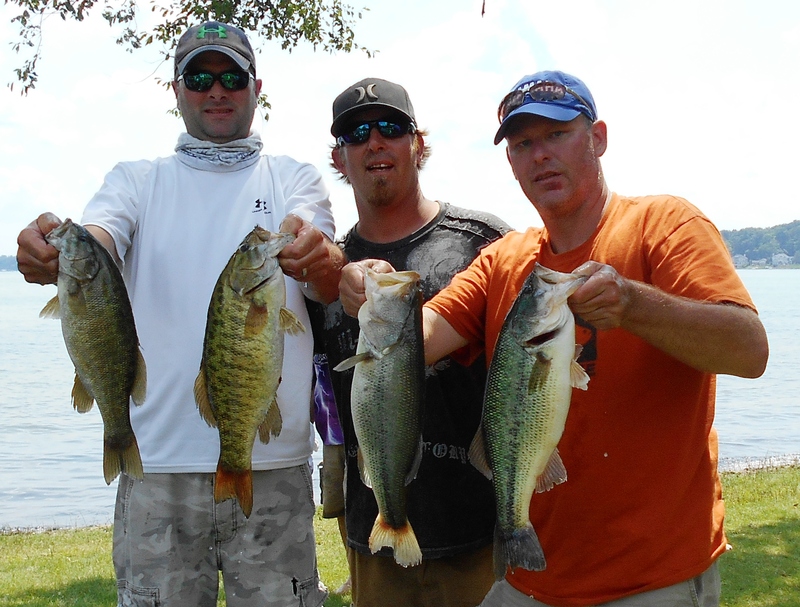 The high finish gave them $486 and the big fish gave them an additional $408, making their day worth $894. Furthermore, despite missing the Randall tournament, they find themselves in the Top 10 of the Standings. 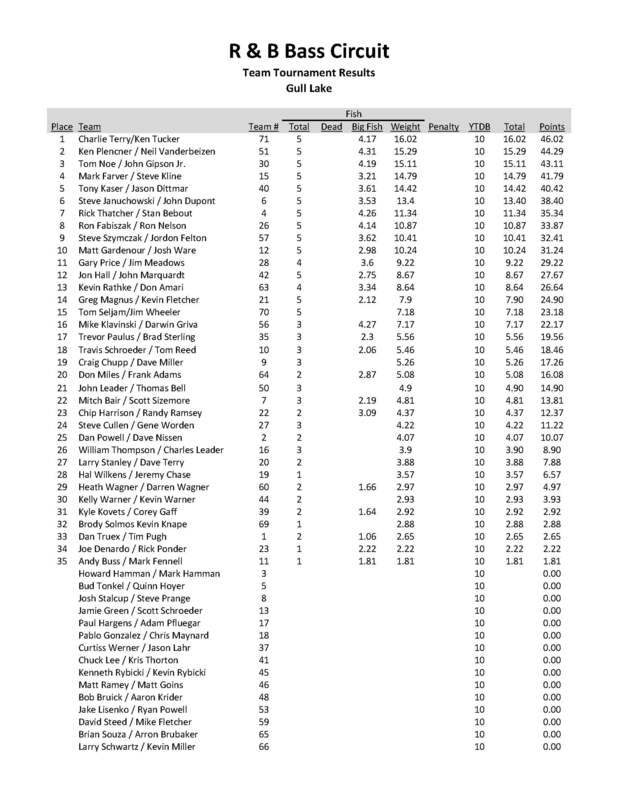 3rd Place: Three out of four is exceptional, and that is exactly the ratio John Gipson, Jr. and Tom Noe have when it comes to top 5 finishes for the 2014 season. 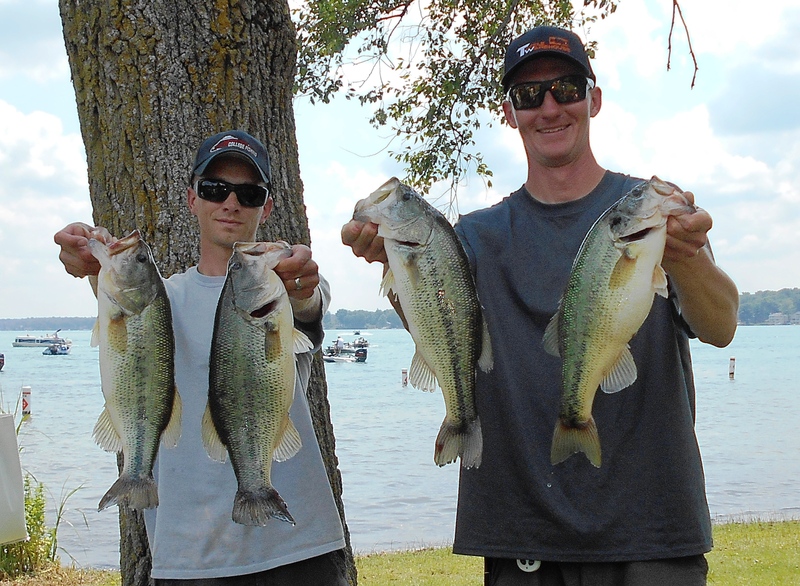 At Gull Lake, they used their electronics in impressive fashion to land a 15.11 pound limit. up high on the Switch Fire mode.” From above, they primarily used drop shot rigs to harass the fish, however they did land a keeper on a jig and flick shake worm. The sun had a major influence: “When the sun came out, the fish were pushed to the very bottom and they bit well. However, when the clouds came out for the last 45 minutes of the tournament, they instantly suspended and were impossible to catch,” admitted Gipson. Four of the five fish they weighed came from a single area and all of their fish came between 20-40 feet deep! They were awarded with $351. 4th Place: With their second top 5 finish in a row, Mark Farver and Steve Kline find themselves in second place overall, and being the team with the second most top 5 finishes, they are poised to make a serious run at the prestigious title, which includes plaques and $400 cash. Like all teams in the top 5, they stayed deep, 18-19 feet, and threw drop shot rigs matched up with Roboworms to bring in a 14.79 pound limit and win $243. However, with just minutes remaining, their biggest fish came on a spinnerbait in 25 feet of water. “I saw a fish on the graph when I had the trolling motor going and went right over it. So I threw a spinnerbait beyond him and slow rolled it back to the boat.” Kline said. “It bit as the bait began coming back up.” A few moments later, they culled again with the drop shot. Those were their last casts of the day. 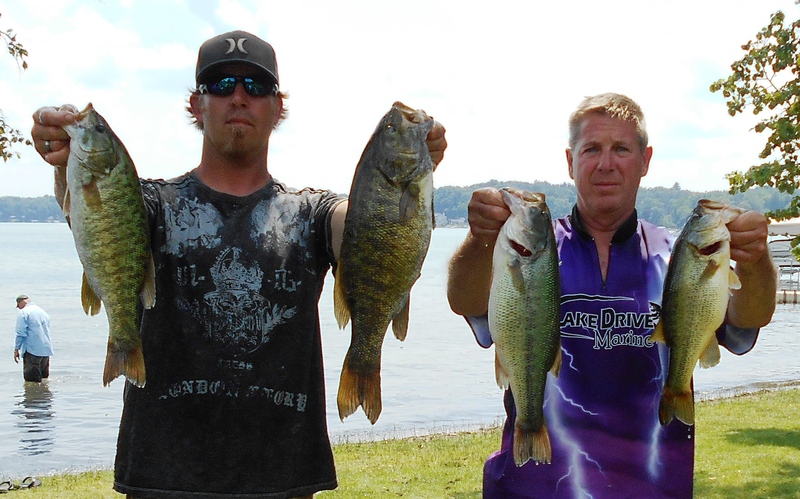 5th Place: The 2011 Classic Champions from Gun Lake, Tony Kaser and Jason Dittmar, landed 14.42 pounds to win $216. 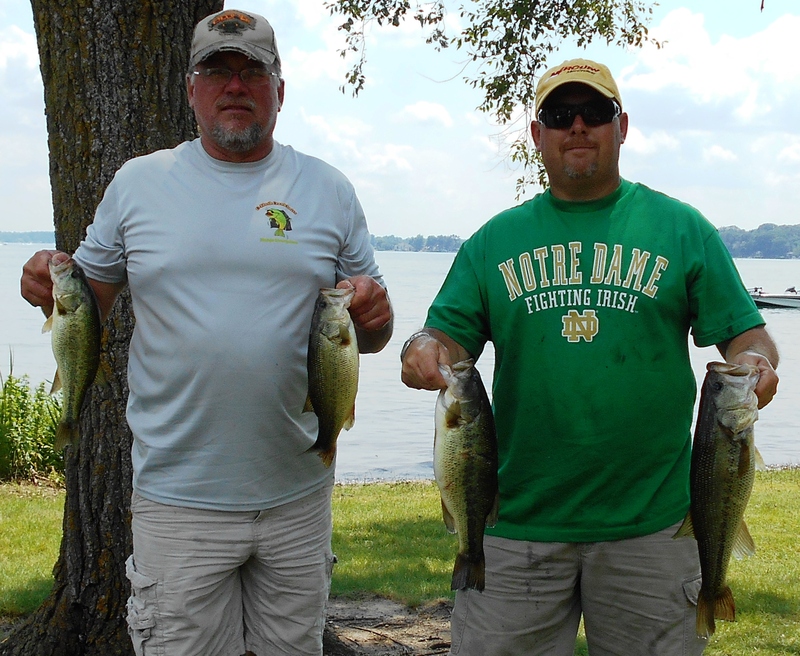 After finding some fish the day before, the tournament held several ups and downs. “We had a limit by 9:30 and felt real good, but then went through a long lull before we were able to cull,” admitted Kaser. They did not cull until 12:30, but they ended with a fury. They too fished deep, 10-25 feet, in four different areas - all of which had a steep breakline and grass. The primary weapon of choice were drop shot rigs with Roboworms, but also got fish on D’s Lures tubes, and Poor Boy’s Erie Darters. 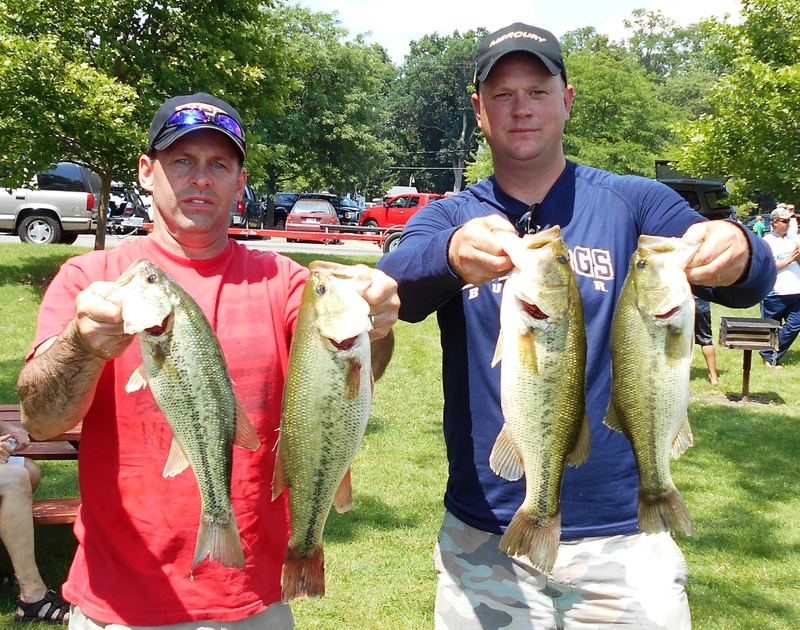 6th Place: A 13.4 pound limit by Steve Januchowski and John DuPont (right) won the team $189. 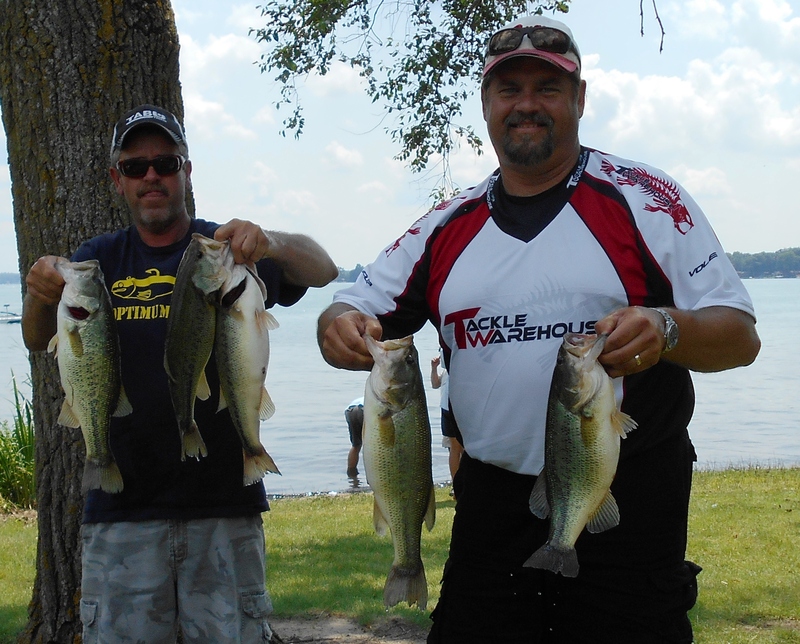 7th Place: Rick Thatcher and Stan Bebout (left) find themselves in fifth place overall because of consistent bags of fish such as the 11.34 pounds here. They won $162. 8th Place: Ron Fabiszak and substitute partner, Mike Elkins (right), weighed 10.87 pounds to earn $122. 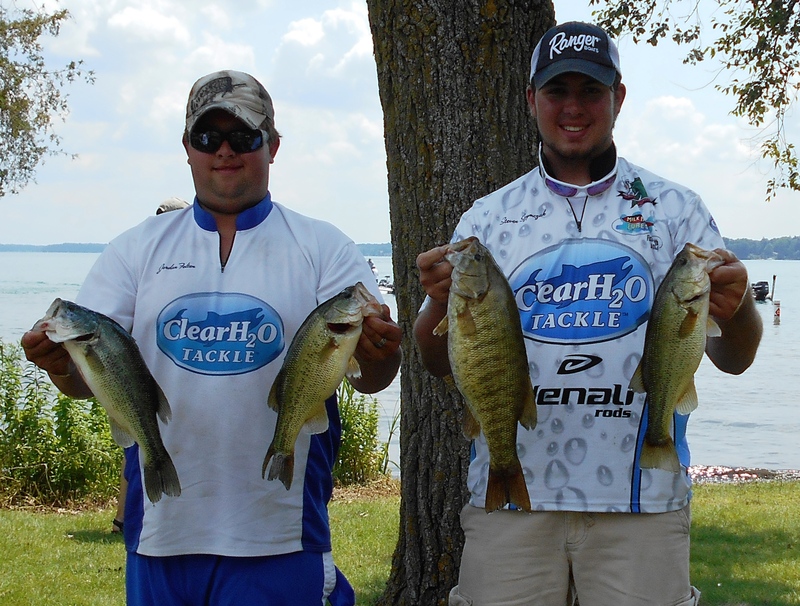 9th Place: The Clearwater Tackle team of Jordan Felton and Steven Szymczak weighed 10.41 pounds to earn $95. 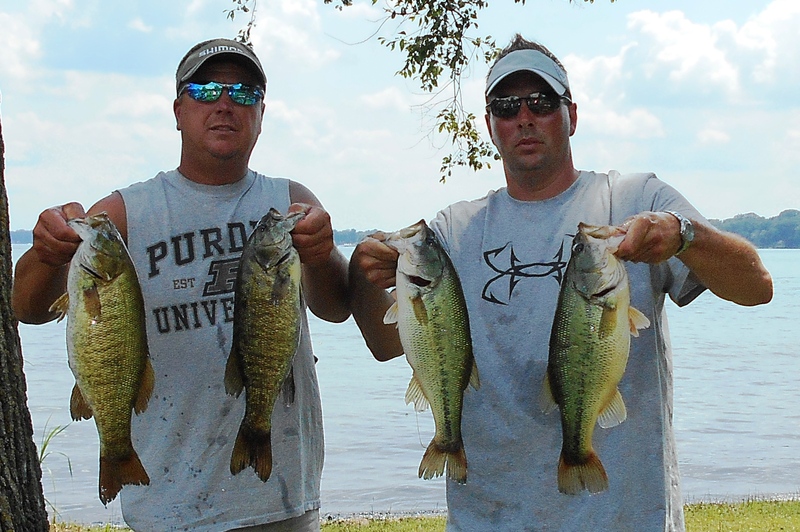 10th Place: Josh Ware (right) and substitute partner finished with a 10.24 pound limit to win $81. D's Lures Award: Jim Meadows and Gary Price (right) earned gear provided by D's Lures by weighing 9.22 pounds, but was not present to collect, so it was handed down to the next team. 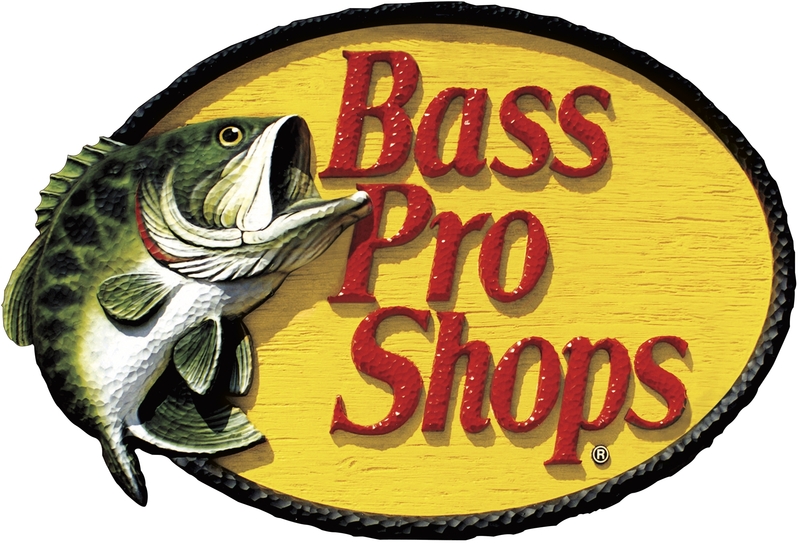 Bass Pro Shops Award: Tom Seljam and Jim Wheeler finished 15th place with 7.18 pounds and won an Extreme reel provided by the BPS store in Portage, Indiana. 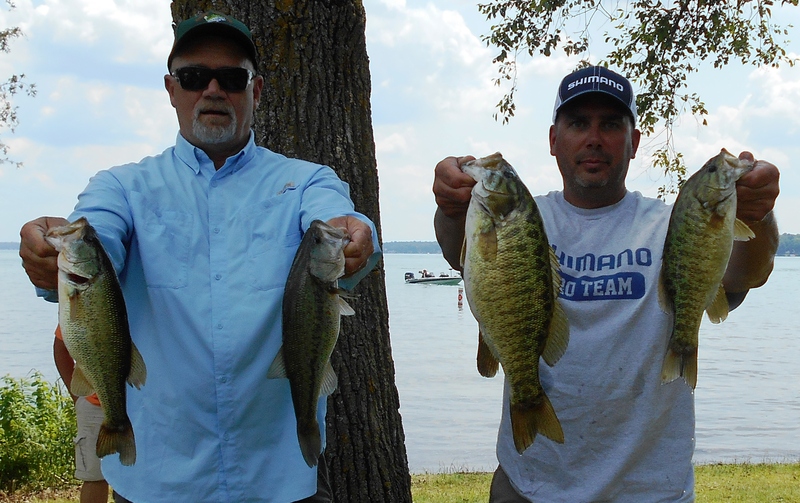 Solar Bat Sunglasses Incentive: Finishing in 20th place with 5.08 pounds, Frank Adams and Don Miles qualified for the Solar Bat Incentive worth $200 in cash. Make sure you are qualified! Starboard Choice Marine Challenge: With just 4.22 pounds and a 24th place finish, Steve Cullen and Gene Worden are eligible for a prize worth $90. 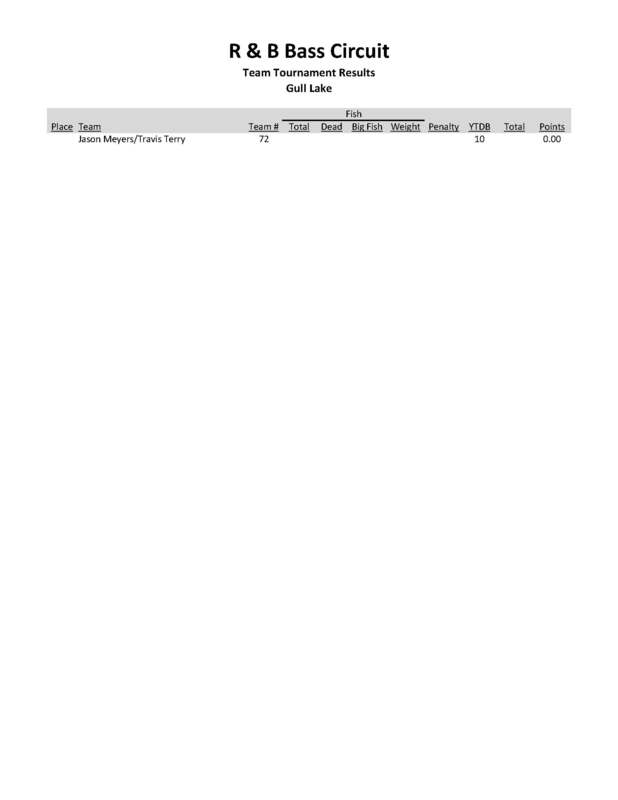 Click on the results for a pdf file.